Easy put together and well built. Keep it streamlined and simple with this ultra-chic, low-profile platform bed. Constructed of North American pine wood with seven-layer pressed pine slats, this minimalist bed can support up to 900 pounds. Easy to assemble, this bed is offered in three finish options. This is a beautiful and well-made bed. As others have noted, be cautious of the sharp corners! Also please note that the slat size is SIX inches apart, not 3-4 inches as suggested in a response to a customer question. This may make it incompatible with some foam mattresses. This bed was purchased by my son for his new apartment. 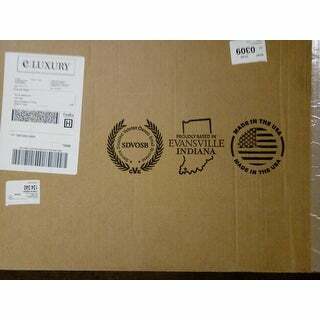 He received it today, and was thrilled to find out it was made in Indiana, USA and not China. He wants to support USA workers. There were many thank you notes signed by American workers. It was easy to assemble, and he is thrilled with its appearance and construction. He will add his new mattress sheets and blankets, and be all set with his new bedroom. Overstock please offer more affordable high quality Made in the USA products ! 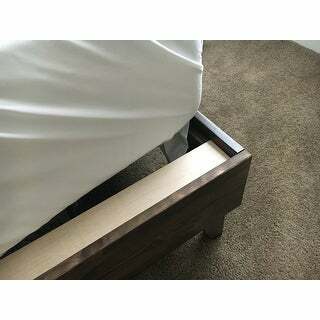 My first initial reaction when opening up the boxes for the eLuxurySupply Artisan North American Hardwood Platform Bed was the quality of the material and the ease of set up process. The box was so much heavier than I anticipated, so I knew that this was going to be a high-quality, durable bed. I was astonished at how flawless the setup process was. You don't need any tools at all to set up this bed which I thought it was crazy. The finish was smooth for my liking, and no additional sanding were needed. 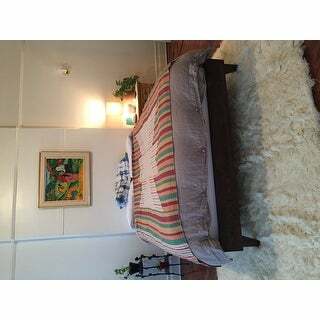 The platform is very sturdy compare to the other beds that are out there. The best part about it is that it's made here in the US. 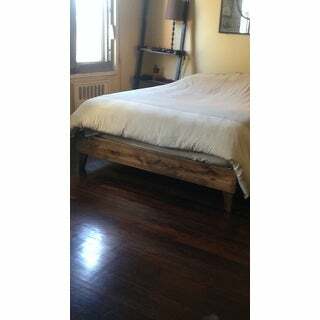 I would definitely recommend this to anyone who is looking for a classic wood platform bed. I bought the King size because I have a leesa mattress and it fits very nice. 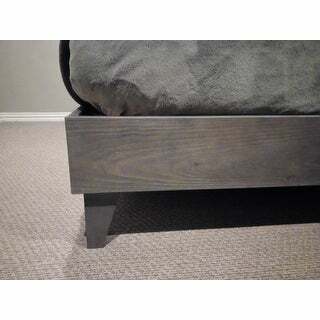 I would definitely recommend this product to everyone who is looking for a nice quality well built platform bed. I love the quality of this frame. It went together easily. I enjoy sleeping now. Between this and my 14 inch memory foam mattress, I am in heaven! When I went in search of a new bed to support the queen mattress I had just bought, I kept reading reviews that X, Y, and Z frames were weak, squeaky, or just crappy in general. I was discouraged because I can't afford to spend *** or more on a true designer mid-century modern bed, but I wanted the look and the quality at the same time. After several days of searching between *** , I'll check overstock.com. Thank goodness I did!!! At the risk of writing a long-winded and exhausting review praising this company and its services and products, I'll just say that this: thank you for showing me such courteous and sweet customer service and producing a bed frame that is sturdy, made with quality lumber, and was seamless to assemble. Not to mention, it is a gorgeous design and it didn't hurt my wallet terribly. You make *** and all these huge furniture monopolies look cheap and fussy. I am SO happy with my new bed frame. Thank you again. Assembly was beyond simple; it took longer to get it out of the box than it did to put it together. It looks good and is very sturdy. The slats are about 4 inches apart, allowing even a foam mattress to not need any further support. When I ordered this bed it said it would come in "multiple boxes" but it only comes in one! The tracking was awesome and made planning easier. I even was immediately notified when there was a shipping delay to to an unforseen incident. And despite the extra 2 day wait I was AMAZED at how easily it was to put together! (5-10 minutes ) and it looks awesome and I'm very impressed at how solid it is! And it's actually higher than I expected! It fits my personal style perfectly! And my Queen mattress fits perfectly! IF you're skeptical - BUY THIS now! You won't be disappointed! I was so happy and surprised when I opened the boxes that contained this frame. It came in two large but manageable boxes. The frame came right out of the package, and get this: there are no tools required to assemble! I know the description said this, but I at least expected to have to deal with some screws or pins. But the time between unboxing the frame and completing the entire assembly literally took 5-10 minutes. The frame slides together, and the platform perfectly sits on top. I did it by myself as well. It sleeps well. It is crazy sturdy and feels super solid. I am a big dude, and I sleep with my girlfriend, and it's clear that this frame will last us a while. It looks stunning too. The wood and stain are beautiful and match our rustic looking house perfectly. There is one reason why I'm giving it 4 stars and not 5 (and it is not a big enough reason to warrant no buying this platform. It's a small problem and we absolutely love it anyways). It is slightly too big. 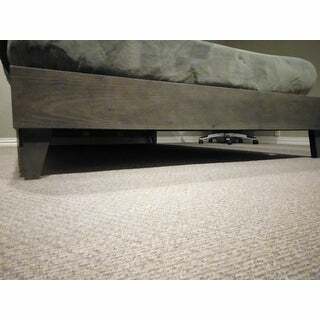 Once we put our California King mattress on it, about 4 inches of the platform was exposed at the foot of the bed. It's not the biggest issue because once we put our sheets and comforter on you couldn't really tell. But we have banged our shins on it quite a few times already. Kind of annoying, but still definitely worth the buy. Overall we are so freaking happy with this buy. For the price and ease of assembly, you can't get better. I was 8 months pregnant when I got this so having something easy to assemble was super important. I don't have patience or time for 3 hour assembly. This took about 5 minutes once I got it out of the box. It shipped fast and even came with a note from the company, thanking me for my purchase. Beside the ease of assembly, it's really beautiful. Very sturdy, too. All solid wood exterior. The support is a layered wood, maybe birch or pine, so I imagine there is some sort of glue to hold it together, which is less ideal that solid wood construction in my mind because I worry about off gassing, but considering, I'm very happy with it. It certainly isn't flimsy. Love the minimalistic aspect. It's hard to tell in the photos, but once the slats are in, there is about an inch of space to the top. Extremely disappointed once my husband put it together and put our mattress on it and it doesn't fit. I'm so unhappy first time this has happened with any of my purchases from here. I ordered a California king size and my California king size mattress hangs off by 4 inches and the Gap at the head of the bed is 6 inches. What makes me more upset is that after having my mattress on the floor for 5 years I saved my money to buy something I liked and it doesn't fit. Hello, I am not usually one to write reviews good or bad but my husband and I have been so disappointed with this bed frame. These last two months (after having the bed frame for 5 months) our bed frame began squeaking. We are to the point now where it is hard to even sleep through the night because each time one of use moves a bit the noise is so annoying. We don't even like lounging in bed anymore because of the disturbance. We are both so disappointed. We loved how easy this bed was to assemble and we saw many great reviews. The style is great but we are very very frustrated with the quality and the lack of time we have gotten out of this frame. There is no reason why this should be happening we are both very thin people. This took less than five minutes to assemble and I didn't have to use any tools. Another plus is that you do not need a box spring with this bed frame. The bed is beautiful, yes. The bed is simple to assemble, yet. But it sways and squeaks like my worst nightmares. It's unbearable. I REALLY wanted to love this bed. I waited almost 5 months before leaving this review because I was hoping there was something to be done about the issues I was having. This bed squeaks like nothing I have ever slept on in my life. I checked how it was assembled, tried re-assembling it multiple times, etc. The slats will occasionally fall out... I wonder if I got a dud that has measurements slightly off... but it drives me crazy and is not worth the almost $*** price tag considering these issues. It's VERY attractive, easy to put to together, and looks amazing. But every time I shift slightly in the night and this bed lets out an awful, loud, creak... I am just pissed off. Very Impressed and Very Pleased! Of course purchasing something like a bed frame online can seem like a bit of a gamble. Will the color be ok? How about the quality? Will it be a huge box and hard to assemble? What if I have to return?? Ugh! All of the questions were put to rest, and quite pleasantly. I tracked the box via Fed Ex and it arrived right on time. The box is about the size of a rectangular surfboard and about 70lbs or so, so it’s definitely on the heavy side. That is to be expected, and better than something lightweight and cheap feeling. They packed it extremely well. It’s condensed, shrink-wrapped, and padded just enough without extra packing. Well done. Once unwrapped, I could see both the color and quality of the bed frame was excellent. In fact, they were both better than I had expected. I’ve included my own photo to show how nicely it goes with the floors of my little studio apartment here in the NYC. After it was unwrapped, it literally took me about 10 minutes to assemble. No tools necessary. Everything simply connects and drops into its slots. Gravity does the rest. Such a simple and intuitive design. If you can chew gum and breathe you can put this together. Lol ;) Also, I do like the personal touch of the “thank you” notes written on the box and on the card inside. Seems like a nice company to do business with for future shopping. Overall, I’m very impressed and very pleased. I hope this helps in your decision making. Best of luck to you as well! The reason I bought this was that it appeared to be sturdy in the pictures. It is. All of the other bed frames of this style are so flimsy that they have to have legs in the middle of the frame to properly support the bed. Not this one! It is constructed of very solid wood. With a good memory foam mattress on it I was unable to make is shake or squeak no matter how much i tried. Not only is it sturdy, it is also very attractive. It has a nice modern finish that shows the grain of the wood. As a bonus, they are made in Indiana by a company owned by disabled veterans. Although i love the look of the bed, the supports arent very durable because they are made of plywood. The first day i got the bed 2 of the cross supports broke. Here i am, a year and a half later with a broken cross support. I paid more for this bed than most other platform beds and the quality wasnt what i expected. Love this bed! So easy to put together, but is very heavy wood, so it is solid. Worked perfectly with our Leesa king size mattress! It looks great in our renovated bedroom with a new headboard purchased separately. This bed is amazing. It is solid wood and very sturdy, it has survived 2 moves without being damaged. The best thing about this bed is - its so easy to assemble and disassemble. My niece has jumped on it several times and it has not broken. I highly recommend it! Good Quality for price. I would recommend this product. Beautiful, quality, heavy-duty frame. It was a breeze to put together and snaps into place easily. The wood is a nice color and it has a natural smell. Love it! About to buy my third for my 3rd bedroom... even though they are all the same, since there's no head board, we can have the comfort sturdiness of the bed but make them all different with different or no headboards. Exceptionally made and highly recommend!! Poorly Made. 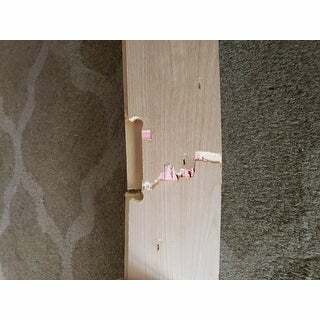 Unfortunately, our platform bed that we purchased wasn't built to the standards of the *** price that we paid for it. The slats are made from two separate half inch cheap plywood stapled together to a another 3/4" piece of plywood. Needless to say the slats didn't last long before the bed broke. I really like the style of the bed, but it does not hold up to what you should be looking for in a platform bed. "Can you add a headboard to this frame? If so. So you sell it as well?" There are no pilot holes pre-drilled in this frame for a headboard to be permanently fixed to the frame. "Do you offer this bedding for sale?" Unfortunately no, the bedding is not available. "How much clearance is there underneath the bed? (for storage, like an under bed storage box)"
There is 6.5" of ground clearance. "Is the table that matches available? The one shown in the picture?" No, the table is not available. "Can you use a box spring with this bed"
Yes, a box frame is not required but you can absolutely use one with this frame. "Can you use with a box spring"
Yeah! Although you really don't need to. The wooden slats underneath will provide enough support for your mattress alone. I would only suggest a box spring if you wanted some additional height to your bed. "can you add a headboard to this bed frame? asking for a teenager with a very specific room decor plan :)"
There aren't any headboard attachment slots, you would have to drill it directly into the wood. I woudln't suggest it.